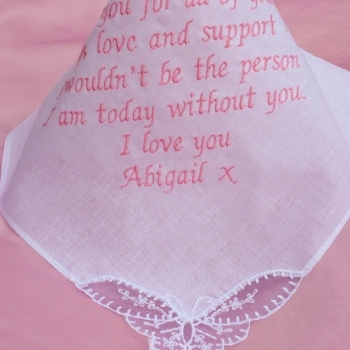 Wedding gift handkerchief embroidered with a longer message or poem up to a max of 45 words. The text will be custom embroidered onto a Ladies Butterfly Lace Corner Cotton Handkerchief. Please type in your poem or message, email us if you have questions. The text will be custom embroidered onto a Ladies Butterfly Lace Corner Cotton Handkerchief. Please type in your poem or message, email us if you have questions. Up to a maximum of 45 words. You can select a font style and fill in what colour thread you want. Optional choices of little motifs that can be added too.